← Cool Giveaway – sign up now! I’ve been away from the blog for a while, between holidays and fighting off the crud. Seems like everyone around here has had it: something between a bad cold and a mild flu. My husband and daughter kicked it in three days; it’s taken me a couple of weeks (thanks to Adrenal Fatigue). But I’m feeling better now, just in time to go back to work. Not how I wanted to spend the five days off I’d planned plus holidays, but I am grateful I was able to take the time away from the office, plus three more days. Christmas itself was fine, other than me and my parents all being sick. We ate Christmas dinner at my house off of paper plates, so no one had to do dishes. That helped a lot. And everyone got gifts they wanted. New Year’s was a laid back evening with friends at my house. One thing I did a lot of during my sick time was read. I read two unpublished nonfiction books by friends, one of which was pretty rough-draft, but both of which held my attention. I read several published books, too. And now it’s time for goals. In some ways, New Year’s Day seems like a silly holiday–we’re just celebrating turning over the calendar–but that’s also a perfect time to assess, reassess, and set new goals with a clean slate (which is worth celebrating). Like most writers I know, I did not get as much done as I wanted, but I still got a respectable amount of stuff done. I finished and released a new novel in my Saturn Society world, set up a Readers Group newsletter, and actually did a little promotion, something I’ve avoided thus far (and my sales have shown it). I also began a new novella related to that latest release, which brings me to this quarter’s goals–or ROW80, Round 1. Finish 1 craft workshop (I’m currently about halfway through it), and practice what I’m learning there. Finish the current novella in progress, and get it to beta readers, and if they turn it around in time, turn it in to my publisher. Review what I’ve already done on Saturn Society Book 3, and sketch out (outline) the second half of the book. What about you–how were your holidays? I hope you and your family stayed well, or if you had the crud, that you’re getting better! How did your 2015 goals turn out? And whether or not you’re participating in ROW80, what kind of goals are you working on now? Please share in the comments–I’d love to hear from you! 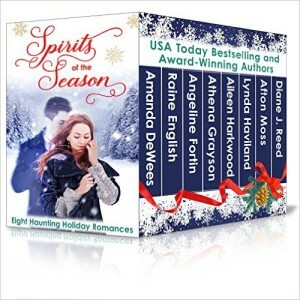 This entry was posted in Blog, Reading, ROW80 and tagged author, goals, good books, holidays, Jennette Marie Powell, ROW80. Oh Dear. Sorry you were sick. Glad you’re better and have some good positive goals for the year. I’m just going to keep chugging on like I did last year. Sorry you got the crud. I’m still coughing. Such a pain. My goal this year is to set writing goals for my projects as they come. So far, it’s finish my editing project by March 1 and begin writing Book 8 in April (I’ll set a finish goal once I actually start the thing). Somewhere in all that I have to publish my novella, but I won’t set a goal for that until I get my novella back from my daughter. Can’t control outside sources, you know? Hugs on being sick! We were fighting the crud big-time here. All three kids and the husband had it. I didn’t start showing symptoms until last night, but we’re all hoping I don’t have it (or that it passes me by!). I am a huge fan of Dean Wesley Smith’s work so finding out about his magazine really makes me happy. Thank you! Good luck with your goals this week and I hope recovery goes smoothly for you. Take good care of yourself, Jennette, and I hope you’re feeling better soon. A couple of weeks before Christmas, my DH got sick, and he’s still fighting the bloody thing. Fortunately it missed the rest of us in the house (touch wood!). My goal this year is to write, write, write (no surprise there) and to get back in touch with my writer friends. Happy New Year! My new apartment is finally put together! So I get to start 2016 already running. This year, I’m going to try dictation, resume crime writing, run a marathon, and get a web design business going. And I promised myself I’d learn to cook, see lots of live blues, and take a weekend off the grid this summer. Stacy, I’m sure I’ll be coughing for another six weeks, as it’s always like that for me. Making one goal at a time makes sense! And don’t set goals that depend on others – that’s what I do, too. Thanks, Dawn – hope you and your family get well soon! 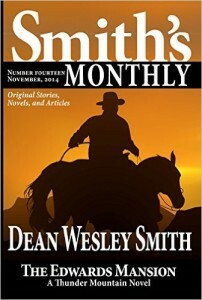 You should definitely check out Smith’s Monthly. They are really good. Sheila, the crud started with my husband too. Hope you’re able to avoid it. And good luck on your goals! Glad to hear you’re feeling better. It can be hard to battle illness when you have a condition that affects your immune system, so I’m glad to hear you’re feeling back to normal. My goals are to get three stories query-ready this year–hopefully expanding one novella to novel length and sending it out, sending out a novella that just needs some polishing, and finishing a few drafts of a novel I started last year. I’m determined that this will be the year I start submitting. Good luck with your goals for 2016! Glad you’re feeling better! You’ve got some great goals listed. I need to make more time for writing and do more promotion. Denise, thanks – and good luck on those submissions! TS, I missed your comment earlier because it went into moderation, but wow, great list of goals! Congrats on the new apartment, and good luck! Hope you’re feeling better again soon, Jennette!